Thankful today for the quirky, the odd, the weird, and the wonderful. Take this gem of a lady, for example. I ran across her a few years ago outside of an antiques establishment. She screams, "America", and yet provides great lighting for your home. It's just the kind of thing I adore. Link up and let me know!! Hello, that would be a cool light to have on our lawn. Thank for hosting! That's so over the top it's simply wonderful; love it! I love it and I'm very thankful to live here! Enjoy your day sweet lady! Hugs! Yes that's very cool and the light looks like it's full of lemonade. Happy Thursday!!!! I love that light! What a bold way to show patriotism. that is really neat! makes me think of something i'd see in black dog salvage! I am with you on this. 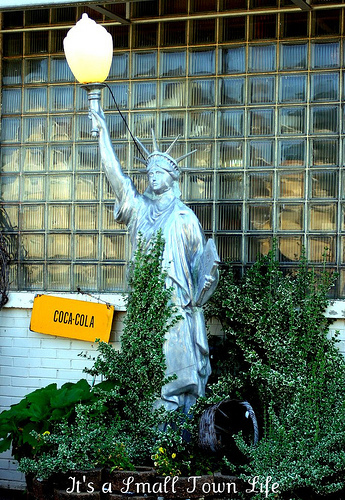 That make a great yard light...or even atop our roof! Now that would be quirky! Hahaha!! the perfect thing for my townhouse - I'm sure my condo association won't mind at all! ...and you didn't buy it? Tom, it wasn't for sale!! I totally would have purchased it, otherwise. Perfect for the farmette. I'm thankful for family and friends and waking up to enjoy each day. Also thankful for blog posts that make me smile, Michelle. May she continue to do and say this: "I lift lamp beside the golden door!" Love that lamp, Michelle! Thankful for art and artists this week. one right after another . . . really beautiful no humidity days! Prettiest Independence Day in along while . . . I am thankful for good health today. Love it! Thankful for our freedom!